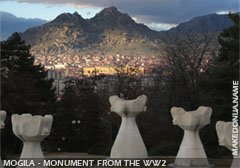 Prilep has around 60,000 residents (while the entire Prilep municipality counts more than 70,000), and it covers 1,675 square km. Prilep is situated in the northern part of Pelagonija valley and it's located on 128 km from Skopje and from the nearby city Kruševo, is just 32 away, while from Bitola is 41 km and from Kavadarci is 49 km away. Prilep can be entered by a car or bus and also by a train. 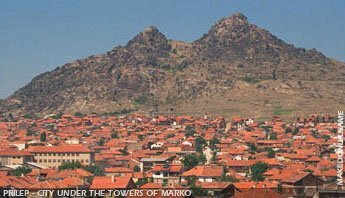 Prilep is often called "Prilep under Marko's Towers" since the town is located on the skirts of the Towers of the legendary hero King Marko who is common in Macedonian folk songs and tales as a powerful, wise ruler, and fighter against the Turks. It was here and in Kumanovo, when on October 11th, 1941, the struggle of the Macedonian people against fascism begun, during the Second World War. The Tomb of the Unconquered, a memorial in honor of the victims of fascism is placed in the town's spacious and beautiful park. Prilep is the largest and most famous center for the production of high-quality tobacco and cigarettes besides its metal processing, electronic, timber, textile, food, and marble industries. 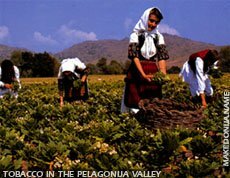 Tobacco is one of the traditional crops which flourishes in the Macedonian climate. Many of the world largest cigarette makers use this tobacco to enrich the aroma and quality of their cigarettes. It is also being processed in local factories and it is the main cash crop in many small holdings. The Macedonian marble Šivec is also known world-wide. The Institute of Old Slavonic Culture is located in Prilep. Each year an International Art Colony is held here, as well as the Festival of Professional Theaters of Macedonia. The Macedonian currency bank-notes, the Denar, is also printed in Prilep. The Old Town's architecture is extremely attractive. Prilep is also a revolutionary town. Several old monasteries are found in the town's immediate vicinity, such is the Monastery of Treskavec, build in the 12th century with the frescoes dating from the 14th and 15th centuries. The Monastery of the Holy Archangel Michael (whose church has some 12th and 14th centuries frescoes) and the Monastery of Zrze (14th century) are also located near Prilep. The award winning Macedonian film "Before the Rain", winner of the Venice's Festival Golden Lion and Oscar nominee for 95, was filmed in Prilep's vicinity, in the village Stavica. And the new one also, Dust in 2001. 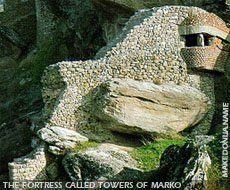 The Fortress (Towers) of King Marko: Marko's towers, are included amongst the five strongest and most unconquerable fortresses in the Balkans. They were named after the last king Marko, but the studies say that it was actually a much older fortress, originating from the 4th century and the 3rd century BC. Archeological excavations revealed the traces of several epochs - from the necropolis of the early iron period, to remains of the ancient population and of the late middle ages. The fortress consists of four defensive areas. 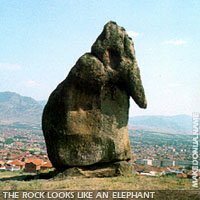 Today, it present a symbol of Prilep. The Varoš monastery complex: In this complex, there are the foundations of necropolis and settlements from the bronze and iron ages, thermal spas from the Roman period and numerous well preserved cultural-historical monuments from the middles ages. The most important monuments from the middle ages are the church St. Nikola (built in 1299) with one of the most important master-pieces from that period in Macedonia; the church St. Dimitrija with preserved reign doorways from the 15th century; St. Atanasius; St. Petar and Holy Mother Prečista, as well as the monastery St. Archangel Michael. The monastery was built between the rock of Marko's towers, it consists of a church and old monastery inns. It is believed that the original church was built in the second half of the 12th century, and later on rebuilt. Fragments of the old painting have been preserved, including the frescoes "Christ in front of Pilat", and "The way to Golghota", "Descending from the cross". The monastery inns were built in the 19th century. The monastery is significant for its preserved stone pillars from the ancient period discovered in the monastery yard. One of them bears an inscription with Cyrillic letters from 996, and after the epitaph of Samoil's parents, this is the second inscription preserved with Cyrillic letters. 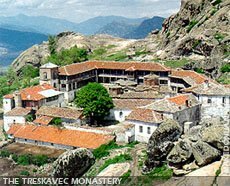 The monastery Treskavec: This monastery is situated under the peak Zlatovrv, in a striking mountain landscape. The monastery complex consists of the church "Assumption of the Holy Mother", monastery inns and the dining room. It is thought that the monastery was built in the 13th century and later in the 14th century, King Milutin renovated it. The monastery inventory includes: a Kosmitos cross and the choir, worked in encrustation. The monastery Zrze: It is located near the village Zrze, 25km west of Prilep. The numerous remnants of the ancient period-pillars, basilica remains, and other exponents speak of the rich cultural tradition, of this area. Today's monastery complex consists of the church "St. Petar and Pavle", the inns and several accessory rooms. The church has been renovated several times, and the painting is preserved only in fragments. In the 14th century, the church walls were painted with painting of extraordinary artistic value. Under the monastery are the monk cells, and their high number indicates the rich life of the monks, who belonged to the highest monastical order. The monastery Slepče: It is located near the village Slepče. The church is located in the monastery yard, and it is dedicated to St. Nikola. It was built in 1672. The interior of the church is completely painted, however the frescos are severely damaged. The church inventory includes the wooden iconostasis made in rich carving, and several icons from the 17th century. The church St. Annunciation: It is located in the centre of Prilep, built in 1838. Among the local population, it is known as the "Old Church", it present a three-nave basilica. It is known for the impressive iconostasis 17 meters long, skillfully representing flora and fauna.